Almost half of the world’s population has access to the internet. While internet facilities in some areas might be top class and not so good in some places, all internet users are well aware of the social media sites that are popular in today’s era. However, do you know what happens in 60 seconds on the internet? 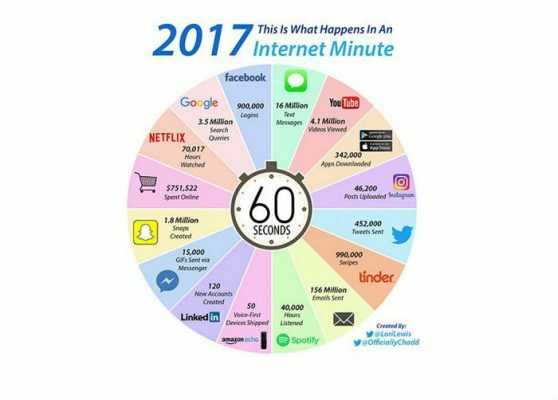 A minute is merely a combination of 60 seconds, but do you know the huge statistics that is behind a mere minute on the internet? What happens in a minute on the internet will both astound and humble you, for the world is a big place and internet users are many. Read on to find out what happens in 60 seconds on the internet. Facebook: There are about 900,000 logins on Facebook in a minute. Google: In an internet minute, there are 3.5 million search queries on Google. NetFlix: Netflix has 70,017 hours watched in an Internet minute. Amazon: People spend about $751,522 in an internet minute. Snapchat: 1.8 million snaps are created in a minute on the internet. Messenger: Facebook Messenger sees about 15000 GIFs sent in a minute. LinkedIn: 120 new accounts are created in LinkedIn in a minute. Amazonecho: in a minute, 50 voice-first Devices are shipped out for delivery. Spotify: 40,000 hours are listened on Spotify, by people all around the world, in a minute. Gmail: about 156 million emails are sent per minute on Gmail. Tinder: An internet minute sees 990,000 swipes on Tinder. Twitter: about 452,000 tweets are sent in an Internet minute, via Twitter. Google Play: about 342,000 apps are downloaded via Google Play in a minute. YouTube: 4.1 million videos are viewed per minute on YouTube. WhatsApp: in an Internet minute, about 16 million Text messages are sent worldwide. With these statistics, it certainly seems that 60 seconds on the internet is not a short time after all!! This data collected by Lori Lewis.